A frog discovered in the cloud forests of the Andes mountains can change the texture of its skin to camouflage with its environment. The mutable rainfrog can transform its skin from smooth to spiky in a few minutes, helping it blend into mossy or leafy surroundings. The frog was first discovered by Case Western Reserve University PhD student Katherine Krynak and her husband Tim Krynak on a moss-covered leaf in the Reserva Las Gralarias nature reserve in north-central Ecuador in 2009. 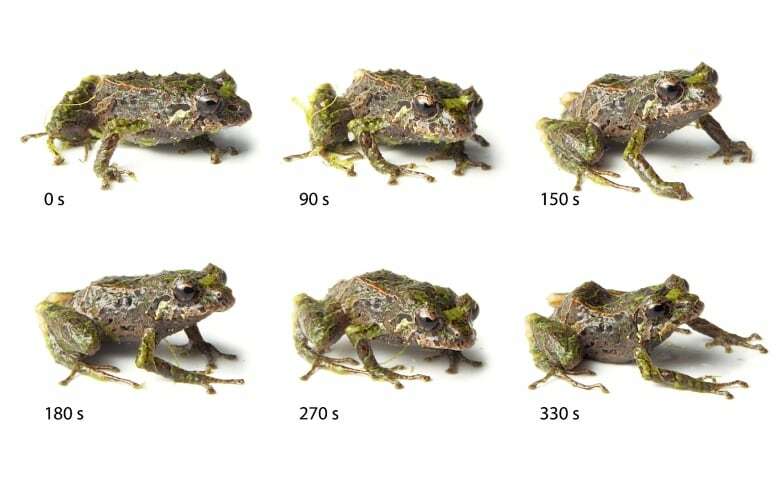 It has been given the scientific name Pristimantis mutabilis by the researchers, who described it in the Zoological Journal of the Linnean Society in March. Watch the video to see the frog transform.